Wireless Whiskers Pet Feeder Review - Does This Selective Feeder Work? 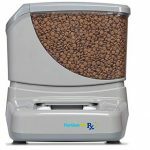 Wireless Whiskers pet feeder is a very sophisticated automatic pet feeder that has several unique features to resolve your cat feeding needs, especially if you have more than one pet at home. This smart automatic feeder keeps each cat away from each other’s food. This is a good option to keep the dog from eating the cat’s food as well. The Wireless Whiskers has the ability to warn if your cat is not eating enough. Also, this unit allows you to separate the daily intake in 1, 4 or 24 intervals, this way your cat will not gorge all the food at once. If your cat or any of your cats attempts to have a one-second-feast the feeder shuts the doors, blocking the food. The total capacity of the Wireless Whiskers is 5 pounds of kibble which lasts about a month for a large cat or a small dog. It works with a wireless RFID collar tag that activates the Wireless Whiskers to open when it’s time to eat. The Wireless Whiskers has the unique ability to feed up to 8 pets (up to 18” tall), measuring, setting and controlling the diet for each one of them. This automatic feeder works with kibble size up to ½” diameter and it’s only suitable for dry food. 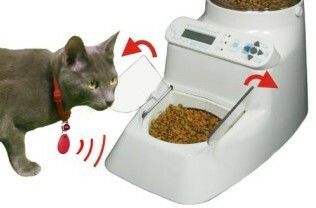 It Automatically calculates and sets your cat(s) daily intake. Allows you to divide the daily food intake in several portions. It keeps your chubby cat from stealing the other pet’s food. Allows you to feed up to 8 different cats with the same feeder. Provides individual feeding stats for each pet. Reduces bad eating behavior such as gorging the food and then vomiting. The feeder can be set automatically or manually. Dimensions (L x W x H): 16 x 9 x 16 inches. 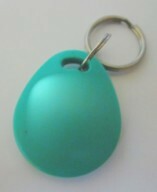 The Wireless Whiskers feeder works via a wireless tag that the pet has attached on its collar. The unit has a bowl where the food is sitting covered by 2 little transparent doors that open when the feeder makes wireless contact with the tag. The feeder shut the compartments once the allowance (daily intake set individually for your cat) is completed. The unit works only for dry food. If you want to see a RFID selective automatic feeder that works for wet food, you can check the SureFeed Microchip feeder. The Wireless Whiskers settings allow you to whether feeding your cat (or cats) with a normal intake, or putting your cat (or cats) on a diet to lose or gain weight. The feeder works with AC Adapter and batteries as backup. 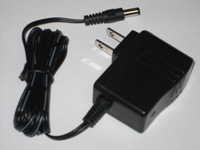 If you only use AC adapter and a power loss occurs all the programming is retained but time & date. The batteries ensure that time & date will be retained if a power outage occurs. However, using backup batteries won’t prevent the feeder from stop operating during lack of power. During a power outage the little doors will automatically open and will stay opened, to ensure your pet will have access to food until the power is restored. The Wireless Whiskers feeder meets high quality standards, and is CE, FCC, ETSI and IC certified and laboratory tested. Default Open: The feeder compartments are always opened by default and it closes when the pet reaches its available allowance (determined by the Daily Allowance divided by the Portion Control interval) or when an excluded pet is detected. This mode is recommended if there is only one cat in the household. Default Shut: The feeder little doors are normally shut and only open when an allowed pet is detected with an available allowance (determined by the Daily Allowance divided by the Portion Control interval). This is the mode recommended if you want to feed more than one cat (you can feed up to 8 cats with the same feeder) or if you have a cat and a dog. Permanently open: The feeder is always open. Permanently shut: The feeder is always shut. If your cat has a normal weight, the Autodiet mode will automatically set the daily food portion for your cat and you don’t need to worry about portions measurement. If your cat eats too fast, with the Portion Control option, you can divide that amount of food in 1 or 4 or 24 intervals during the day. When a new cat or pet is detected, the Autodiet Wizard mode is activated. The Autodiet Wizard purpose is to establish the normal food intake for each pet. From the beginning of the day and throughout 24 hours, the system records how much time your cat spends eating. After 1-3 days (selectable) the feeder calculates and set the proper daily intake for each pet. From there, each pet will be allowed to eat until its daily intake is reached. If one of your pets tries to overeat, the system will shut the doors. You can manually set the allowance (amount of food you want your cat to eat). The ideal is letting the Autodiet Wizard set the allowances automatically for your pets. But in the case of kittens and puppies the dietary needs are different and they need to have permanent access to the food. In this situation it is recommended to set the allowance to unlimited. Once the daily allowance for your pet or pets have been set whether manually or by Autodiet Wizard, you can decrease (or increase) your cat daily allowance as a percentage of its normal allowance to program an individualized diet. You can adjust the feeder to put on a diet one or more cats by decreasing the default regular allowance in 10% decrements (or increments if you want your cat to gain weight). Whether being in default mode or adjusted in a diet mode, the feeder monitors your cat feeding activity. If your cat eats too little, an alert flash is going to show. This feature prevents from your cat to gorging its allowance at once. You can sub-divide the daily allowance into 1, 4 or 24 intervals to complete a preset allowance (amount of food to be eaten in 24 hours). Once the allowance is reached the feeder shuts. This means that the minimum amount of food of 1 tablespoon can’t be programmed by size (this is a gravity type feeder) but by the time the doors will stay opened. This is a good application for multi-pet households in which one of the pets has a special Rx diet or a different type of food and you don’t want the other pet or pets to eat from that food. You can accomplish this just by setting two Wireless Whiskers stations, one for the pet with special prescription diet and the other for the rest of the pets. Make sure your cat collar is not tight so this way allows the tag to be always down, facing the feeder. Test the unit without food and see how it works. Once you are 100% sure you like the performance of the feeder, place food in it (this is a gravity type feeder so you can test it without food). Once the unit has been used, the money back guarantee applies up to 50% of the price. Easy to setup and add pets to the system as well. One unit allows you to feed one or more cats, measuring and setting an individual diet for each one of them and controlling the intake individually as well. It allows you to stop the chubby cat to steal the food from the docile and skinny one. 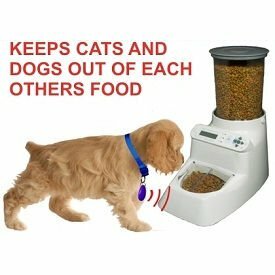 You can stop your cat or dog from eating each other’s food by using two feeders, one for the cat (or cats) and the other for the dog. Excellent solution for multi-pet households in which one pet has prescription diet or pets with different foods. It records and displays stats of how much your cat or cats have eaten during the day and the day before. Good capacity to hold food. Cats obsessed with food may get around the plastic doors and eat from the side (setting the door control to Default Shut fixes this). Battery backup works only to retain the programmed clock. Without power the doors stay open. If the tag does not meet the sensor within 2 inches from the top, the feeder won’t open. The same if the tag is hanging sideways and not facing the feeder within that distance. Cats need to go through a learning process to get the idea of how this system works. They don’t know the system in the beginning and it might scare them at first, but then they will learn how it works. Try not to be pushy when introducing the unit to shy cats. New feature “Detection Interval” allows you to adjust the time from the last detection of the allowed cat to when the doors close. With a smaller detection window the doors close quickly if a pet either walks away or raises its head. The minimum interval is 3 seconds. 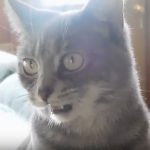 If the sensor detects a cat that does not have an allowance, the doors shut immediately and if they feel a blockage, they will re-open and rapidly will try to re-shut. If your cats are competing too much for food, set the feeder in Default Shut. This way the unit will be always closed until the allowed cat approaches the feeder. 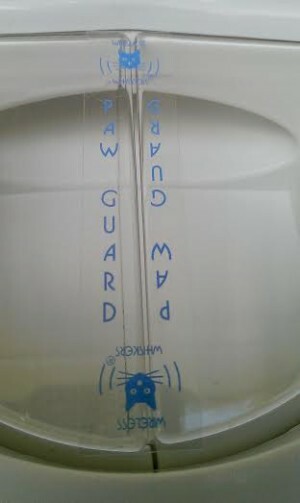 If your cat tries to open the doors using its claws, the Paw Guard will prevent this. For bullier cats that won’t give up trying to steal food. If you want a 100% money-back guarantee within first 30 days after using the feeder (you can get up to 50% refund if you use the feeder). Machine hasn’t kept the right date since day one. Now it doesn’t keep time, this is important if you are trying to maintain the animals weight. 30 day warranty is over and the machine needs an upgraded software package – it’s 5 months old. There are other products out there like this one. I wish I had bought someone elses. Have you tried using the feeder with batteries as backup? I had the same problem the worst part was that i locked my cats out for almost two days while we were away. It hasn’t work well since the day i got it and to send it back cost almost as much as a new one!! do you know of any other types of similar feeders? 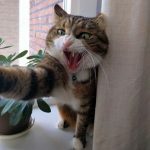 I have a cat and 2 dogs and I want to stop the dogs eating the cats food! Hi Tess, feeders with RFID technology that I know is the Wireless Whiskers, Wonder Bowl and SureFeed. Another option is to setup a feeding station with a cat flap to allow only the cat to get in and eat. You can setup a cat feeding station or you can install the cat flap in one of the interior walls connecting to a room where dogs can’t have access so you place any automatic feeder or food bowl in that room. With a cat flap the cat needs to wear a collar. Hope this helps! I bought the product and it malfunctioned within 4 days. Now they are giving me a hard time about repairing or returning it. The WORST customer service on record. I liked the idea, as I have one obese cat and one skinny one but I may try 2 Wonder Bowls instead. What a waste of money and time!!!! Hi Jennifer, if your product malfunctioned within 4 days, you should be able to get the unit repaired. I am sorry you had a bad experience with this feeder. As my ultimate goal is to help people, I am leaving your comment here so your experience will help others. Thanks for sharing. We have attempted to process a potential warranty return with this customer. However she will not cooperate with our efforts to determine the nature of the problem so we can determine whether replacement parts can be sent, a return is necessary or if the problem can be resolved by simply performing a reset. The customer prefers to be threatening and combative rather than cooperate with our reasonable inquiries to process this issue. If this customer would spend 1/10 of the time cooperating rather than spreading hate mail on every bulletin board her problem would already have been solved. Sounds like lacking customer service, if you ask me. Customers don’t want to jump through hoops, just get her a replacement or a full refund. I have been looking for a feeder to keep my diabetic cat out of the dry food. After reading this response. I’ll look at a different company. This response was unprofessional and shows how others should expect to be treated if they have a problem. Shame on you. Potential buyers beware. While the concept of The Wireless Whiskers feeder is great, the unit is horrible. I have had it for 2 years and have had nothing but problems since day 1. Initially the customer service folks responded quickly sounding as though they cared. that quickly turned to it being my problem and that their defective unit was not to blame. It does not keep the settings correctly, nor does the display show correctly. for instance the letters are all jumbled so reading the display is next to impossible. While doing a factory reset is an option, you have to set up your pets tags and other adjustments each time a reset is done. Doing that with 5 cats got old quickly. Unless the company can prove they have corrected their technology I would NOT recommend this unit. Hello Donna,thanks for sharing your experience with this automatic feeder. I can see it has not been a good one at all. I am sharing your opinion with my readers so they see all type of experiences, they can evaluate and take a well informed decision. Thanks again! In addition to the cons, they forgot to mention that their return policy is crazy and they refuse any return for reasons not accepted by them. It doesn’t work for our pets, it’s that simple. It’s all laid out in this article. The concept is sound the follow through and consumer support is not there. I would never recommend this to anyone based on their unwillingness to work with customers more than to say that with persistence it will work…. No it won’t. either one cat starves or the other feeds uncontrolled. Thanks for sharing your experience Alex. I have had Wireless Whiskers for 2 years and it has been a joy. It takes all the work out of feeding my 3 cats and keeping their weight. I originally got it because 2 of my cats were fat. It figures out their allowances by the AutoDiet Wizard. I set my fat cats on a -20% diet on normal cat at 0% with the Adjust AutoDiet widget and within about 4 months all the cats were at perfect weight. About the only thing I do now is fill it up every couple of weeks. I saw some comments about the feeder losing time. This can happen if there is a power outage, to avoid it just install back up batteries. Couldn’t be happier – love this machine! I got a cat three months ago, and since I work all day, I used to leave food out so that she can eat whenever she gets hungry. After a few weeks, I realized that she was starting to get obese and once, I even found puke on the floor. 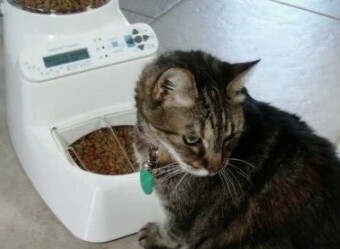 I started researching online and read about automatic pet feeder. After researching and reading reviews, I decided to buy this Wireless Whiskers Feeder. This product is perfect because it regulates and portions out the food my cat consumes. I just fill the feeder, which holds a substantial amount of food, and I can leave for work without having to think about my cat eating too much in one sitting. It was very easy to set up and I definitely recommend this feeder! It is especially great if you have multiple pets because you can program this feeder to add up to 8 pets. Thanks for sharing your experience Anna! I’ve had my Wireless Auto Diet Pet Feeder for about a month now and I am highly impressed. Not only with the speedy delivery of my product, but with the awesome results I have experienced. My feeder allows me to set the time and amount of food to be given to Humphrey (my chunky cat) so that I can finally control his diet. And I love the cool “welcome” feature that greets Humphrey by name…he meows every time! Since my initial purchase, Humphrey has slimmed down to a healthy weight and Roscoe (my terrier) no longer eats both cat and dog food thank to my auto pet feeder. I would definitely recommend this product to any pet owner. You’ll be glad that you did, I know I am! I am happy you have a good experience with this feeder. Thanks for sharing. We just added a kitten to our family and have a dachshund who eats everything. One of the most important things is not to over feed them because of back problems due to being over weight. At our last visit to the vet we found our pup was over weight. She was eating the kitten food and her own. This product was perfect to help regulate what she was eating. Since we often put their food down and leave for work it was able to keep our over weight pup out of the kittens food. I would recommend this product to anyone who has multiple pets. Does the tag use IR or RFID? If it uses IR does that mean the tag needs a battery? The feeder works with RFID and the tag does not need battery. The feeder needs batteries to backup time & date if unplugged or in case of power outage. I did not realize that the portion control is divided up by time, for example, for 1 m the door will be opened for 2 second. I prefer the auger type feeder, but all other products does not provide 24 hour duration (8 feedings at most per day). We have a very smart, but a sick cat that can only eat a very small portion through out the day. She is too smart and will rip the door open. Think carefully before you purchase as you are responsible for shipping cost (for us $20 each way) and 20% restocking fees around $25. That is a total of $65 for our mistake. THIS IS NOT A COMPLAINT ABOUT the product or vendor. We read the review that it serves 1 tsp and thought that it portions food by size rather than by time. We also have a smart, sick cat. We would like this machine to feed him a teaspoon of dry food between 5-8AM and again between 3-6PM. Do you think it will do this? This is to prevent him from throwing up BEFORE his regular meals of canned food (he can’t eat much dry food). Hi MauiGardener, this is a gravity type feeder with automatic control to food access. You can’t program meal sizes but by how long the doors will stay opened. Hi I have to cats I fly a Lot I need a solution to feed then did you guys fix the few problems that you have with the automatic cat feeder? Are you still selling the product or have a new product? I read some of the reviews and feel I must have the wrong version. The one I have from wireless wiskers works fantastic. I have 3 cats and 1 dog and I wanted to keep the dog out of the cats food without having to put the cats dish separate. I also have a cat that needs a diet. I also didn’t want to have to refill the bowl so often when needing to be away. This hasn’t failed me yet. Very sophisticated and flexible feeder but not as smart as my 7 month old kittens. Although they are not on a diet they tend to gorge themselves so we are giving them the 100% allowance but divided into 4-6hour periods…. The problem? They have figured out that they can scoop food out of the bowl and pile it up in front of the feeder while it is open so they can eat as much as they want during any period whether it is closed or not. Haven’t figured out how to tell the manufacturer about this behavior or figure a way to prevent/discourage this practice. Does not matter if the default is open or closed…they scoop it out when they are allowed to feed and since feeding allowance is based on time and NOT mass/volume they just pull out everything they want when it is open so they can eat later when they may be out of their allowance for that period! Hi Erik, cats are very smart and versatile animals that adapt their behaviour according to their needs. Some cats are smarter than others and that’s the case with your kitten. One of the problem of some automatic pet feeders is that they are not suitable for very smart cats. This unit is a gravity feeder covered by a lid that opens automatically and that means it exposes all the food when opens. I’ve got the same problem. I have a couple ideas I’m going to try. #1) Cclassic spray bottle “Hand of god” warning. When I catch her scooping, hit her with a stream of water from a hidden distance. #2) Retrain the unit based upon the new feeding pattern. Leave doors in the locked position by default. This should allow the cat to scoop its expected amount while limiting the time available for scooping since the door would have to be triggered to allow it. #3) Just close the doors, but it sounds like that does not work for others. #4) Lock the problem cat out and feed her directly. #5) Come up with some kind of insert that covers the bottom 1″ of the feeding tray. This would create a small recess that might prevent successful scooping. I have the same problem as Erik – industrious cat scooping out food for himself and everyone else. I have one elderly cat who needs to not gorge, and one who needs to lose weight. Very frustrating. I’m looking into putting it on a stand of some sort so he can’t crouch and use his hands.